headline right. Cancelling Little Stoke parkrun is a GOOD thing. Parish Council voted to charge runners £1 each to use the park. Over 8,000 parkrunners this week were first timers. Running participation has increased hugely over the past few years, with one million more people running every week than a decade ago. parkrun is helping to change the world into a healthier place. 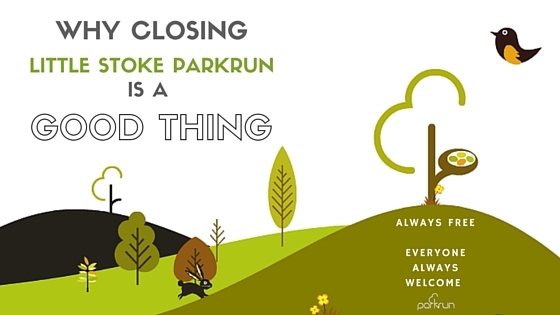 of parkrun and its many thousands of participants from Little Stoke and beyond. park is also something we are unable to do. contribute to the upkeep of the park. parkrun contribute to the maintenance of the park? happy parkrunners using the park. spaces were there for us to enjoy. park every week far outweighs the potential ‘damage’ from overuse and cost of upkeep. 2012), and you’ve got 33,725.
parkrun to set up a new event. they’ve scanned their barcodes in. And in 30 years, when the path needs resurfacing again, the children of today’s Little Stoke Junior parkrunners can join other runners to throw their tenner into the pot. What do you think about the closure of Little Stoke? Would you pay £1 per week for parkrun?